Like multi-coloured roses among thorns, they stand proudly. Do you think they are showing off, like peacocks with inflated egos? Maybe, maybe not. But unassisted, they sell themselves, screaming at the top of their voices: "Here I am: this is what we offer on the Nature Isle". Who are they? They are a gallery of multi- coloured paintings on wheels. Take a look. You will see a brown Mountain Chicken, forgetting it is near extinction, on its hind legs leaping, leaping, leaping at you; a slice of blood red watermelon and yellow mangoes whispering seductively- 'I dare you, taste me'; golden sunsets smiling at gently waving coconut palms; the pirate Jack Sparrow of Pirates of the Caribbean jumping from the bushes, sword swinging, raucously laughing, smelling like the sea. No, no, no…this not fantasy; these are the themes on the safari trucks that shout about Dominica's pristine forest, the crystal-clear waterfalls, the diverse wildlife, the rich culture and the bountiful agriculture. But beauty comes at a cost and for the three business men we spoke to, it's a worthwhile investment. These brightly-coloured safaris are new to Dominica and according to owner of Lion Tours, Andy Hogan of Mahaut, he was inspired by the reactions that another safari trucks were receiving, and he decided to own one when British tourists demanded what they called 'open air' tours. "Sometimes I used to wonder what they calling 'open air' because I used to have the air condition vehicles," he said. "So my friend on the next side did one and he was doing very well, so I decide that the competition will be getting very tight. "So I bought the truck and I did the box for it, design it, now without the painting it not really looking attractive, now when people pass they take out photos". 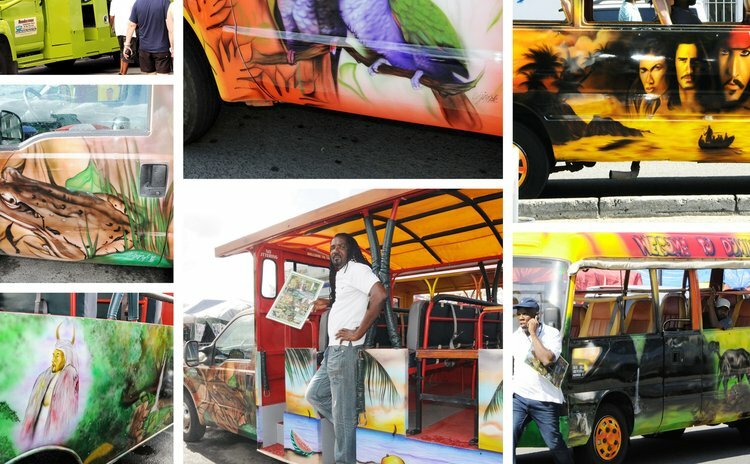 He said his new safari and catchy name with paintings of the agouti in the wild enjoying a ripe banana, the Carib Indian beating drums, fruits and vegetables, underwater life, topped with a picture of a lion on the back of the vehicle, is bringing good business his way. He said the basic painting done at a garage cost $ 6,000 and he spent another $6,000 on the painting done by a Trinidadian. Gerald John Care from Eggleston who has been in the tourism industry since he was 17 said he had a few buses but he decided that he wanted to do something different so he decided to invest in a safari truck. The safari sells itself, he said, so it's less hustle to do tours. Tourists see more, enjoy themselves more and that is what they demand. His painting depicts Dominica's forest, the Mountain Chicken, agouti, iguana and fresh water crab; he also has a mural of himself as Congoree, one of the maroons. He said the painting cost $7,000, but, he stated, if you manage your investment properly you will recover your investment. Another brightly painted safari truck caught my eye. Large sea turtles, sugar cane, pineapples, a golden Dominican sunset and the Emerald Pool come alive on a truck owned by Abel 'Mr. Able' James of Petite Savanne. He said the safari is only three years old and he too made a large investment when he purchased the vehicle for $ 120,000; then a box had to be built and sprayed which cost him $6,000 and to air brush it with the attractive scenes cost him another $ 6,000. James said he took the decision to make the investment when his bus was turned down for a safari. "When we look at the system and what the people like …and sometimes when I walk with people towards my bus they turn me down and take the safari, so I said, I will have to invest there," he said. When asked about the reactions of officials of the Discover Dominica Authority to the painted trucks, James said they marvelled. Chief Executive Director of the Discover Dominica Authority Colin Piper told the Sun that the more variety that can be offered to the consumer hopefully the better. "We just want new and different products available. As you recall when the trolley train came a year or two ago, it was something new and different. Those safari vehicles are new and different to Dominica, they have been in existence in other destinations before, and if it's a requirement of the passengers then it's simply a case of supply meeting demand. "We appreciate the innovation of doing something different …it's a good thing," he said, adding that a duty free scheme is available to all taxi operators once they meet certain terms and conditions.